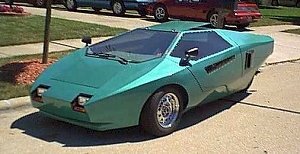 The Vortex was created by Dolphin Vehicles in the mid 1980s in the USA. The vehicle was a DIY car for the home enthusiast to build from the ground up from plans that were purchased from Dolphin Industries. The Vortex had a monocoque chassis that was made from plywood and fibreglass with a metal sub frame to hold the rear drive unit and suspension. 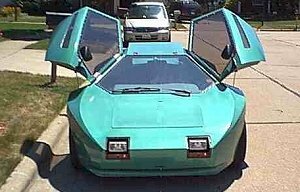 The body was made of foam and covered with fiberglass and featured a removable sunroof and “butterfly” type passenger doors that opened up and forward. The Vortex could be powered from either an electric motor or a petrol motorcycle engine like the 1000 cc Honda engine.